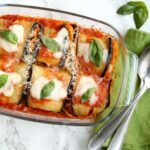 Eggplant Doublets are a must for Sunday lunch in Sicily. Simple to put together, it's a different, ( and totally tasty) way to present the classic spaghetti with tomato and fried eggplant. Preheat the oven at 200C/400F degrees. Drain the eggplant slices from their water first. Put them in a colander and sprinkle with a little salt, cover with a plate then put a weight on top for 20 min. In the meantime, in a pan of lightly salt boiling water cook the spaghetti al dente, 3-4 minutes before the time indicated by the box. Drain and transfer into a large bowl. Pour in 2/3 of the tomato sauce, a bunch of fresh basil and mix with spaghetti until combined. Put plenty of oil in a pan over medium heat. When hot enough, fry the slices in batches ( do not overcrowd the pan), until golden but not overly crisp. Drain eggplant slices on kitchen paper and set aside. Spread a little tomato sauce over the base of a baking dish. Arrange a forkful of spaghetti over a slice of eggplant, sprinkle with mozzarella and fold it as a blanket. Transfer the "sandwich" into the baking dish and repeat with remaining slices. Pour the remaining sauce over the top of your eggplant sandwiches, sprinkle with cheese and remaining mozzarella. Bake in the oven for 10 mins, until crispy. Season with freshly ground black pepper, decorate with basil leaves and serve immediately!